How We Pared Down Our Belongs to Fit in 460 Square Feet! – Y is For Home! How We Pared Down Our Belongs to Fit in 460 Square Feet! When Seth and I were first married we rented a two bedroom apartment in town with a lot of space and a tiny yard. It was such a pretty place! And we filled it with all our things. The second bedroom became a pottery studio, we had a dining room with a little writing nook and a bright front room full of plants. Then we found our beloved land and we jumped into off-grid life in a one room yurt. A lot of things had to go before we could move into our tiny new house, and we had no idea how to go about reducing our belongings! 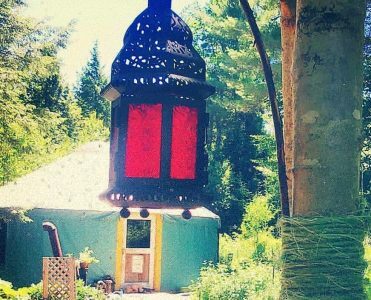 Because we were going from a conventional apartment to an off-grid yurt, we could easily give away everything that depended on electricity: mixer, toaster, curling iron.. but what about all the clutter? If Konmari had been around in 2010, I would have been all over it! But it wasn’t. And honestly, minimalism wasn’t even on my radar. But we needed to downsize in a major way. First, we took a close look at our new space. Or, the floor anyway.. our yurt was so delayed in production that we were actually tenting on our land for a week before we could set it up, with all our things tucked in a second-hand shed we threw up as quickly as possible. But we walked the platform, and decided just what we really wanted to have in our tiny, new house: a bed, the little rattan couch, a table to eat at, some shelves, books, a counter to work at and an altar. Everything we were uncertain about, or divided on stayed in that rickety old shed or was sent off to the donation box. We had so much extra space in that brand-new yurt and we loved it! So many things that seemed so essential in the apartment were never moved into the new house. We didn’t want to clutter up it’s fresh interior with things that we didn’t actually miss. And so they stayed tucked away in the old shed until winter came and the snowload crushed the roof of the shed and all it’s trinkets were damaged in the rust and wet of snow and metal. if I’d been more thoughtful and intentional about this move, I could have donated all that stuff and saved the mess. But I wasn’t. I was new at all this and careless. I still have some of the shed to tear down, actually. We’re going to use the old metal to re-roof the outhouse and build a pig-shed. So we’re salvaging some of the waste! You don’t have to know what you’re doing to move into a tiny house! You just go with it and maybe realize 3 years later that you brought in too much stuff, or got rid of too much. It’s an adjustment – most of us are learning to live counter-culturally, against the consumerism we used to know. And that can be super hard. Don’t make it harder by thinking you have to do it all at once, or do it right the first time. You don’t. We certainly didn’t! We went tiny by giving up about a third of our belongings, donating books and appliances, gifting friends with some of our extra dishes, papering the outhouse with old poetry books, and leaving lamps for the new renters at our old apartment (we asked them first! ); we moved about a third of our things into the yurt and ended up culling more than half of those original belonging again a few years later; and we wasted a third, mostly books and burnable wood furniture (thank goodness!) by storing it for a while in hopes of finding or building a home for it. If I were to do it again, I’d give up more and save less. But that’s what houses are all about, they grow with us. They embrace our attitudes and intentions, and flourish as we truly get to know them. Journeys aren’t everything, but they’re amazing ways to learn.